Experience the magic of a room with a view in Paris, France. Lie in bed and watch the twinkling lights of the Eiffel Tower, wake up in Montmartre and watch the sunrise over the rooftops of Paris, gaze in wonder at the dancing lights on the Seine at night, and cheer on the triumphant winner of the Tour de France from your private terrace. 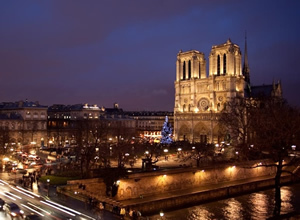 Any of these views can be yours, for rates cheaper than you may think, by staying at one of the hotels with a panoramic view of Paris listed below. The Hotel Notre Dame Saint-Michel, directly facing the Notre Dame Cathedral, is housed in a 400 year old building recently renovated by the famous fashion designer Christian Lacroix. The 26 rooms are uniquely designed to combine the "old" with the "new." Original wood beams and stone walls are complemented by thick carpet designed to look like medieval paving stones, and striking contemporary murals on the walls. But the design pales in comparison to the "million dollar views" through each room's large French windows. The Hotel Quai Voltaire has been famous for centuries for its one-of-a-kind panoramic view across the Seine River to the extravagant exterior of the Louvre, formerly a royal palace - now an art museum. Artists, musicians and writers, such as Baudelaire, Oscar Wilde, Wagner and Picasso have resided at the Hotel Quai Voltaire, and were inspired by the views to create legendary works of art. Stay in the room where Picasso painted what he saw outside his window in "Quai Malaquia" or where Wagner composed his famous symphony, "Mastersingers of Nuremberg. 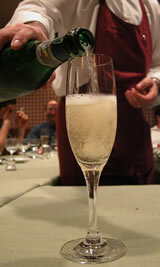 "Rooms are very basic in this two star hotel, but the scene outside of your window is priceless. 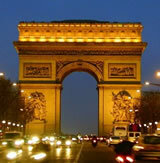 The four-star Hotel Brighton overlooks the Tuileries Gardens and is located steps from the Louvre Museum. The lush, manicured Tuileries Gardens, originally designed for royalty, are the oldest gardens in Paris and feature marble statues, small lakes, and exquisite flower beds. Step out on your room's terrace for sweeping views over the Tuileries Gardens with the Eiffel Tower rising in the distance. 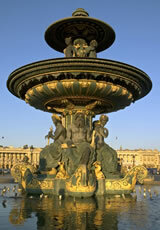 Turn your head to view the Pyramids and fountains in the courtyard of the Louvre. The Hotel Brighton is also one of the few hotels in Paris to have an unobstructed view of the Tour de France as riders race up the Champs Elysees to the finish line. Hotel Brighton as Viewed from the Tuileries Gardens. 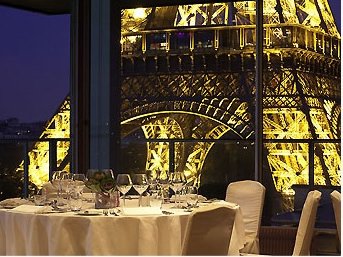 You can't get closer to the Eiffel Tower than staying at the Pullman Paris Tour Eiffel. 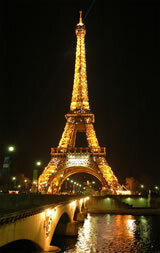 Enter your room and marvel at the sheer size of the Eiffel Tower dominating the scene outside of your window. Walk five minutes through the Champs de Mars park, gaze up at the Tower, then ride up to the top for a panoramic view over Paris, France. The 460 rooms are modern and large in size for Paris hotels. Some rooms contain Queen and King-sized beds. Stacked on a hillside in Montmartre, the highest area in Paris and home to famous artists such as Picasso, Renoir, Monet, Dali, and Toulous-Lautrec; the 2-star Timhotel has 5-star views over the rooftops of Paris. Request a room on the 4th or 5th floor for views of the Sacre Couer Basilica and the steep, winding streets of Montmartre, or a panoramic view over the Paris skyline with the Eiffel Tower twinkling in the distance. 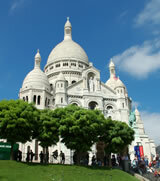 The hotel is a five minute walk from popular Montmartre attractions, such as the Place du Tetre, home to an outdoor artists market; the wind-milled Moulin Rouge with its famous burlesque dancers, and Sacre Couer Basilica. 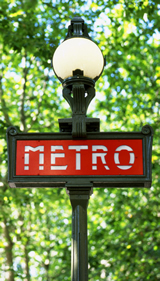 The recently renovated Dusquesne Eiffel is a boutique hotel located a few blocks from the Eiffel Tower, and a 5 minute walk to Les Invalides, the gold-domed French Military Museum and resting place for Napoleon's tomb. 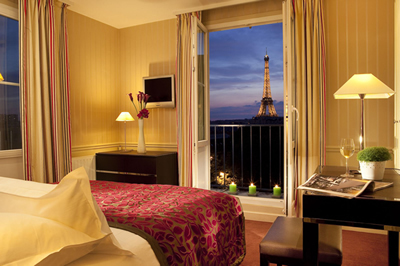 Request a Superior Room with a Queen-sized bed for a stunning view of the Eiffel Tower. Rooms with an Eiffel Tower view start at approx. 200€ per night - reasonably priced for this expensive area. Dusquesne Eiffel Hotel, 23 avenue Duquesne -75007; Phone: + 33-01-44-42-09-09; Metro: Ecole Militaire, St. Francois Xavier, Cambronne, RER C Invalides.